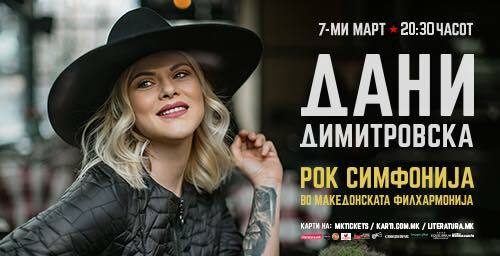 Dani Dimitrovska, 20 years on the Macedonian music scene with a jubilee concert in the heart of the LOVE CITY, at the Macedonian Philharmonic. Together with the Philharmonic Orchestra and under the baton of Bisera Chadlovska, she invites you to a unique musical experience. Be a part of spectacle, and experience her hits in a completely different way. 07. March, (Thursday) at 20:30.